This document is a technical summary of the Federal Highway Administration reports, Reformulated Pavement Remaining Service Life Framework (FHWA-HRT-13-038) and Pavement Remaining Service Interval Implementation Guidelines (FHWA-HRT-13-050). At the heart of pavement management decisions is the prediction of future construction events; however, many issues exist with the current remaining service life (RSL) terminology. The major source of uncertainty is the use of the term “life” to represent different points in the construction timeline. The path to consistency involves adopting terminology of time remaining until a defined construction treatment is required (i.e., RSL is replaced by remaining service interval (RSI)). The term RSI has the ability to unify the outcome of different approaches for determining needs by focusing on when and what treatments are needed as well as the service interruption created. This TechBrief introduces the RSI concept and its implementation process. Many decisions are necessary in order to successfully provide and manage a pavement network. At the heart of those decisions is the prediction of future construction events, which requires monitoring the condition of the pavement network and forecasting future performance. Predicting RSL of the network segments is critical; knowing or estimating future pavement condition is the rational basis for informed decisions. Many issues exist in the current RSL terminology that confuse and complicate its usage. One common definition of RSL is the time until the next rehabilitation or reconstruction event. These are two different events in terms of the condition of the pavement at the time of construction as well as the associated construction costs. Also, the timing of the next rehabilitation or reconstruction depends on future lower-level treatments applied. Another common definition of RSL is the time until a condition threshold limit is reached. This approach shares the same issues as rehabilitation and reconstruction RSL units, but it also introduces other service and safety condition indices, which further complicate the RSL meaning. Interpretation of a single RSL number gets more complicated when it is based on multiple condition states. A third approach to RSL is based on agency management rules on the time between applications of corrective pavement construction treatments. In this approach, an agency creates policy rules on the maximum time between applications of corrective treatments (e.g., place an overlay every 9 years). RSL becomes the time until the next treatment is scheduled. However, this approach does not provide for optimal distribution under a limited funds constraint scenario. An unintentional consequence of using current RSL terminology is that it may promote the more costly “worst-first” approaches to correcting pavement deficiencies where the pavement is allowed to deteriorate to poor condition or its “threshold limit” before taking steps to rehabilitate it. By expressing pavement condition in terms of RSL, laymen and politicians expect that pavements in the worst condition are treated first, which tends to cost the most. From a communication standpoint, while the engineer who computed a RSL value has full knowledge of what that life end point means, the current RSL terminology leads to possible misinterpretation by the recipient of the information. When RSL information is communicated, the details of the end point may not be obvious, and the recipient may interpret what that end point means. Compounding the issue, there are multiple definitions and interpretations for RSL that further aggravate the potential for misinterpretation. Even within pavement engineers and managers, RSL may have one meaning to those in preservation and another to those in design or budgeting. The major source of uncertainty in the current RSL definition is the use of the term “life” to represent different points in the construction history. The term “life” is interpreted differently by different stakeholders. In the pavement design context, “life” is used to represent the time until the as-designed pavement structure reaches an unacceptable condition. In the pavement management context, the as-constructed properties become more important in pavement life expectations. Moreover, as a repairable system, system life is not defined by the failure of a correctable component. The basic process to determine future pavement construction needs is illustrated in figure 1. Most pavement construction activity planning is based on an annual fiscal time cycle used by an agency. The process starts with input data that are fed into the performance prediction curves to produce predictions of future change in the construction trigger models. 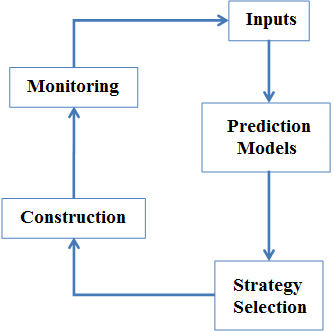 The outputs from the predictions are used to select the most appropriate construction strategy, which is used to develop construction plans and specifications. Monitoring measurements are performed to provide updated inputs for the next planning cycle and also to refine the prediction models. Figure 1. Flowchart. Future pavement construction needs process. A controlled vocabulary to define pavement construction events. A common basis for when the future construction event is needed. Determination of how future needs are established (i.e., different levels of business decisions). Location and extent of the needed treatment. Crack sealing: Application of sealants in surface cracks. Reconstruction: Removal and replacement of all bound layers of an existing pavement. Roughness exceeds limiting International Reference Roughness Index value. Cracking exceeds limit requiring reconstruction. Typically, an agency will develop a decision matrix to use as part of its pavement management, which relates reason(s) for construction with types of construction events. 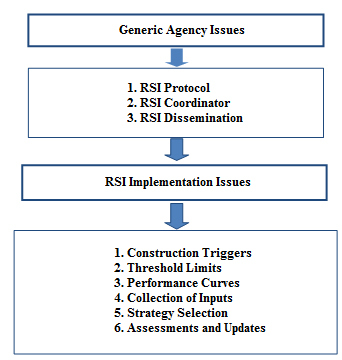 The framework for implementing the new RSI terminology is illustrated in figure 2. The key components of the framework that should be addressed by highway agencies include generic and RSI implementation issues. The generic issues address the establishment of the agency’s RSI protocol, the identification of an RSI coordinator, and the dissemination of the RSI concept within the agency. These issues need to be addressed once with periodic monitoring and revisions to ensure that they are still appropriate. Figure 2. Flowchart. Agency RSI implementation. Setting construction triggers: Construction triggers are measurable aspects or other aspects of a pavement’s condition that can be used to indicate the need for a corrective treatment. Examples of construction triggers that may be considered by an agency include level of service, pavement distress, structural considerations, safety aspects, and agency time-based rules. Setting threshold limits: Threshold limits are used to indicate when a construction trigger reaches a condition and when a construction treatment is needed. There are two general types of threshold limits—one related to road users (e.g., ride quality) and one based on agency economics (e.g., cracking and faulting). Methods that can be used to establish threshold limits include subjective, engineering, empirical, economic analysis, and a combination of these methods. Selecting or developing performance prediction curves: These curves are used to predict the time when the pavement condition will reach a construction trigger threshold. The current practice is to base the curves on the analysis of pavement performance observations, which requires long-term pavement condition data. When empirical data are not available, the creation of curves based on best available information can be used as a surrogate starting point to judge the relative performance of pavements. Performance prediction curve options include models based on design equations, empirical models, and agency time-based rules. Identifying collection of inputs: The collection of data on the condition state of pavements under an agency’s jurisdiction should be based on the same construction triggers that form the basis for project-level decisions on construction needs. Potential inputs to the RSI process include pavement roughness, distress, structural response, traffic loads, and climate. In addition to these and other data inputs, it is important to give consideration to the missing data, measurement variability, sampling intervals, and frequency issues. Establishing a strategy selection process: Selecting the most appropriate construction strategy has many facets and considerations that start with pavement condition subject to other constraints such as budget. At the network level, the objective is to characterize the current condition state of pavements in the network that require consideration of appropriate corrective treatments. The recommended practice is to use life-cycle cost concepts to optimize the selection of construction projects in the next cycle and forecast future construction needs. At the project level, the objective is to provide detailed decisions on what corrective construction treatments are needed for each project identified from network-level needs analysis. Life-cycle cost analysis can be supplemented with cost engineering considerations specific to the project. The RSI concept does not provide an alternative to assessing the health of the network or making decisions about where to spend available funds. The concept provides a clear terminology and a logical process to move away from erroneous statements (i.e., “this pavement has only 5 remaining years of life”) and toward a consistent construction event-based terminology and understanding. This promotes a common and consistent understanding of an agency’s pavement network assessment and funding needs among multiple and diverse stakeholders. An added benefit of adopting the RSI terminology is that it provides a readily available way to communicate impacts of alternate budget scenarios. Elkins, G.E., Thompson, T.M., Groeger, J.L., Visintine, B., and Rada, G.R. (2013). Reformulated Pavement Remaining Service Life Framework, Report No. FHWA-HRT-13-038, Federal Highway Administration, Washington, DC. Elkins, G.E., Rada, G.R., Groeger, J.L., and Visintine, B. (2013). Pavement Remaining Service Interval Implementation Guidelines, Report No. FHWA-HRT-13-050, Federal Highway Administration, Washington, DC. Researchers—This study was performed by AMEC Environment & Infrastructure, Inc.
Availability—This TechBrief may be obtained from the FHWA Product Distribution Center by e-mail to report.center@fhwa.dot.gov, fax to (814) 239-2156, phone to (814) 239-1160, or online at https://www.fhwa.dot.gov/research. The full report is available online at: https://www.fhwa.dot.gov/research. Key Words—Remaining service life, Remaining life, Remaining service interval, Life-cycle cost analysis, Pavement management, Pavement rehabilitation decisions.